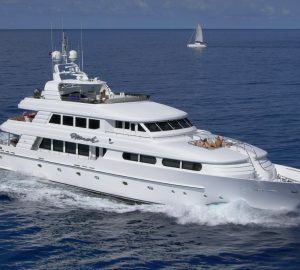 SCOTT FREE (ex Bonita) is a 26.52m (87') motor yacht built by Cheoy Lee in 2005 and refitted in 2016. With interior design by Argonautica Yacht Interiors, she is able to offer accommodation for up to six guests, while she is serviced by a crew of three ensuring everyone on board has a relaxing charter vacation. The lower deck swim platform stores the jet ski during transit, and provides guests with a large sun bathing area while at anchor. The main deck aft has a sofa integrated into the stern, with a raised table and additional chairs for alfresco dining beneath the shade of the flybridge hardtop. 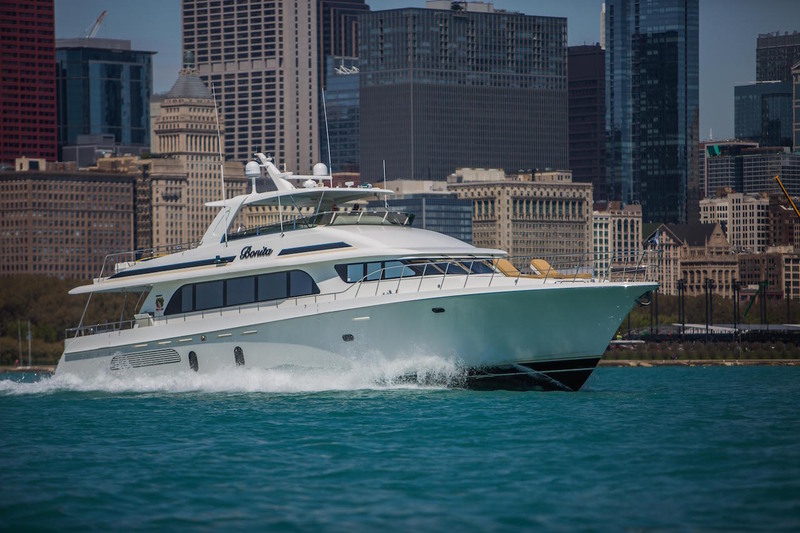 The foredeck also has a seat for taking in the forward views, and the flybridge above has an alfresco dining area and lounge beneath the hardtop. The beautiful interior uses classic elements with Art Noveau touches that can be found in the glass chandelier above the formal dining area, as well as the glass lampshades. The lower deck hosts the guest and crew accommodation, with the tender garage placed behind the engine room to the stern. The main deck places the helm station and galley forward with a starboard C-shaped sofa and raised table for casual breakfasts in a room flooded with light. Behind the galley is the main foyer and the open plan formal dining area and salon. The formal dining area seats the group in an atmospheric environment perfect for evening meals, and the aft lounge is furnished with a starboard bar and piano for live entertainment as well as a port sofa with a coffee table. A TV is integrated into the aft port wall. Caterpillar C-30 diesel engines produce 1,550 HP for quick cruising between island destinations. SCOTT FREE offers accommodation for up to six charter guests in classically styled cabins with deluxe facilities. We do have available further amenity, owner and price information for the 26.52m (87') yacht SCOTT FREE, so please enquire for more information.